Whether it is because development was rushed, promises were not kept or some other hidden issues, I can point to quite a few games that have initially released with a lot of bugs, lackluster support or generally underwhelming gameplay. Thankfully, we live in era where games can be updated weeks, months or even years later that can drastically improve what was once thought dead on arrival. Mass Effect: Andromeda was one of the games I was looking forward to at the beginning of 2017, but there were two key reasons that held me off playing the game. The foremost was the fact that it was released around some very stiff competition that took a lot of my time to play through, namely Horizon: Zero Dawn, Kingdom Hearts 1.5 and 2.5 HD Remix for PS4 and Zelda: Breath of the Wild. Then there were a multitude of issues that bogged the game down, including the notorious facial animations, as well as mixed reviews from websites that described it as a "hot mess". Suffice it to say that Mass Effect: Andromeda took a back seat to others and went to my backlog until very recently. Since the release of Mass Effect: Andromeda, BioWare has put its full effort into fixing most of the bugs in the game. Some could argue that it should have been good to go at the release, but at least seeing a studio admit its errors and go back into the game to fine-tune it and improve the problems shows a lot of ownership. Also learning that BioWare’s other studios lent support for updates to Montreal studio which developed Andromeda showed how serious they were in making it right for fans of the series. I have also listened to a variety of podcasts and friends that have said that the game is worth playing even if I end up not liking the story that much. Having played the previous three titles in the franchise, there has also been a part of me yelling that I was not a “true fan” if I didn't give the game a chance. All the improvements, show of support, my undying love for the franchise and the eventual good stories about the game had me desiring to dust the game off and give it a go. I have played through the beginning and the tutorial of the game with no crashes or bugs to name of. What is most striking to me is that the environments are gorgeous. Landing on the first world and seeing the attention to detail had me really think how much effort was put into the game, but also made me understand how ambitious the developers were in their vision. 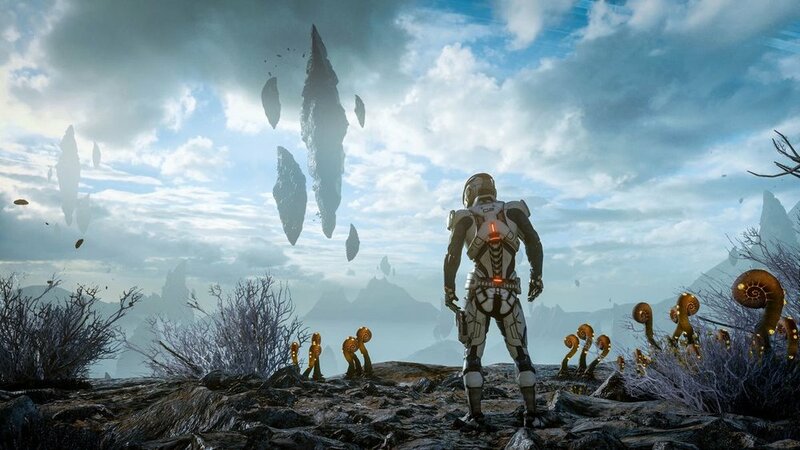 While the environments and levels were linear during my play session, I would argue that BioWare was shooting for a very atmospheric approach at least to begin with. There would be occasions that my comrade and I would walk up to a ledge, which had you look off into the distance seeing geysers and flying rocks beyond the horizon. The world felt very alive and there was also a mystery that was lingering in the air. The gameplay was a highlight for me as well. You have a jetpack that shoots you into the air, you can command your squad to certain points on the battlefield and the shooting felt very responsive. The world and the combat both have me really wanting to play more of what is now a very fine-tuned game. It's safe to say that the improvements, the gameplay and the intriguing mystery will have me completing Mass Effect: Andromeda to see how far the game has come and learn what potential it actually has. As visions of owning a farm and occasionally hiring myself out as a bounty hunter danced in my head, I wondered what form the game would take. Would it be the Cowpoke Simulator 20XX that I wanted it to be? Or was is going to be Grand Theft Auto: Online with horses? The short and easy answer is a resounding “yes” to the latter. Last week was an exciting week for us here at Darkstation and for gamers all over the world. Of course we are talking about the release of Mass Effect 3. It took our staff by storm and we had to get as many editors that we could pry away from the game to give their impressions on the experience so far. And as you might also expect they seem to really be enjoying it.